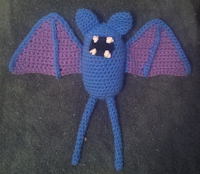 Zubat is combination of a few bat projects that I have patterns for. I took the body from one and the wings from another. Zubat is smaller than I originally planned for it to be. The chenille stem was put into the tails to add stability to them. 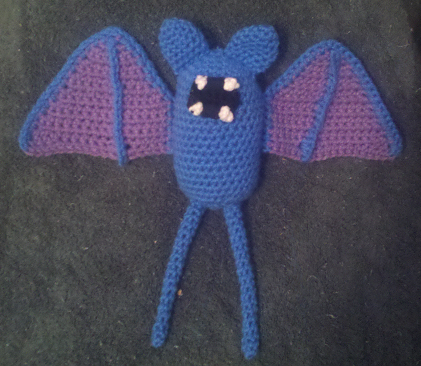 Once I finished Zubat, I wished that I had used some floral wire in the wings. Begin stuffing at this point, continue stuffing as you progress. F/O leaving a long tail. Add any stuffing needed to finish out the shape, weave the tail through the last round and pull to close. Weave in ends. F/O leaving a long tail. Flatten and sew to body. Weave in ends. F/O leaving a long tail. Push chenille stem inside of tail. Sew to body. Weave in ends. F/O leaving a long tail. Once teeth are added, sew to front of body. Weave in ends. F/O. Fold teeth forward and secure down either sewing them or gluing them. Sew wing to side of body. Make sure that center wing bar is facing forward. Weave in ends. Zubat and Pokemon are copyright Nintendo. This pattern is an original pattern by Christjan Bee (June 2011). Please do not claim this pattern as your own. If you wish to share this pattern, you may link to this pattern but please do not reprint it on your site. You may keep a copy for your own personal use but you may not sell or distribute it, or sell items made from this pattern.